Leading to the concept of vitamins, the first vitamin to be discovered was thiamine or vitamin B1. High concentration of thiamine is found in the liver, kidneys, brain, heart and skeletal muscles. Thiamine deficiency is common among individuals with high consumption of alcohol and increased intake of refined grains. This B-complex vitamin is important for the production of energy, protection of the heart, enhancement of the brain activities and for the regulation of mood and overall well-being. 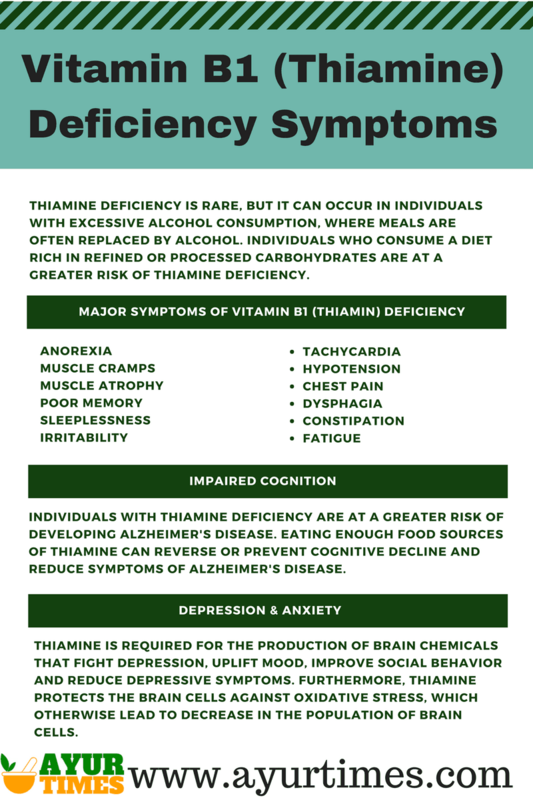 Vitamin B1 (Thiamine) Deficiency Symptoms include decreased food intake (anorexia), muscle cramps, muscle atrophy, poor memory, sleeplessness, irritability, tachycardia, hypotension, chest pain, dysphagia, constipation, fatigue, etc. Low thiamine nutritional status is associated with reduced food intake and increased energy expenditure, which results in weight loss. Insufficiency of thiamine inhibits the action of a compound that regulates food intake and energy metabolism. Such an insufficiency affects a part of the brain, which in turn alters hormones linked to hunger and energy balance. Eating foods rich in thiamine can restore appetite and reverse thiamine deficiency-induced weight loss. Getting adequate thiamine from the diet is essential to support healthy brain function. It energizes the brain and improves memory, learning and thought process. It protects the outer covering of the nerve cells and prevents their destruction. Furthermore, the human brain requires thiamine to use glucose for energy. Without thiamine, brain cells do not get energy and they die. This important vitamin is also needed to produce brain chemicals that send signals to other cells. Clinical studies have observed that not getting enough thiamine could increase the risk of heart diseases. Thiamin supplementation improves the ability of the heart to pump the blood effectively. It enhances relaxation and contraction of heart muscles and thus, it improves overall functioning of the heart. Human brain is sensitive to the disturbance of thiamine. Literature has found that low concentrations of thiamine are associated with depression and anxiety. Thiamine is required for the production of brain chemicals that fight depression, uplift mood, improve social behavior and reduce depressive symptoms. Furthermore, thiamine protects the brain cells against oxidative stress, which otherwise lead to decrease in the population of brain cells. Pain, tenderness, weakness and stiffness of the muscles accompanied by inflammation has a negative impact on the overall quality of life. Such a condition can arise from deficiency of thiamine. A low level of thiamine in the body can affect the sleep cycle and lead to insomnia. Thiamine is involved in the synthesis of neurotransmitters that play a key role in the regulation of sleep and circadian cycle.